Tyne and Wear has a fair share of theatres and most of them are based at the Eastern region. The major theatres among them are the Empire in Sunderland and the Theatre Royal in Newcastle. Apart from this, Newcastle has another theatre called the Newcastle Opera house. The Opera House is a traditional theatre and is rated by many, as one of the finest examples of Victorian theatre. Apart from the main auditorium, which has a capacity of over 1100, some performances also take place at the Bistro Bar. This is ideal for less-formal settings. One of the most important theatres in Britain - the Newcastle Opera House was opened in 1867. The theatre was originally named 'The Tyne Theatre and Opera House' and later in the year 2000, the name was simplified to 'Newcastle Opera House'. As the name suggests, the theatre in Newcastle is the best place in the city for music concerts. Apart from music concerts, other performing arts such as plays, musicals and cinemas also take place at the Newcastle theatre. The most important feature of the theatre in Newcastle is the acoustics, which deserve special mention. This auditorium has probably the finest acoustic abilities in the whole of Britain. To ensure this, the walls are lined with wood and the ceiling is very special indeed. The dome of the theatre is also made from wood and carries the smallest whisper on stage to the far corners of the gallery. 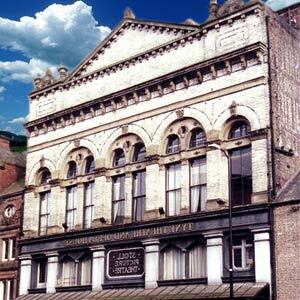 In the early 19th century, the Newcastle theatre was converted to a cinema and renamed as the Stoll Picture house. The opera house served as a cinema until 1974, when it was closed for showing x-rated films. However the theatre sustained a heavy fire during 1985, which left the back stage and the proscenium severely damaged. With efforts from Jack Dixon, the theatre was renovated and started conducting plays along the Tyneside.